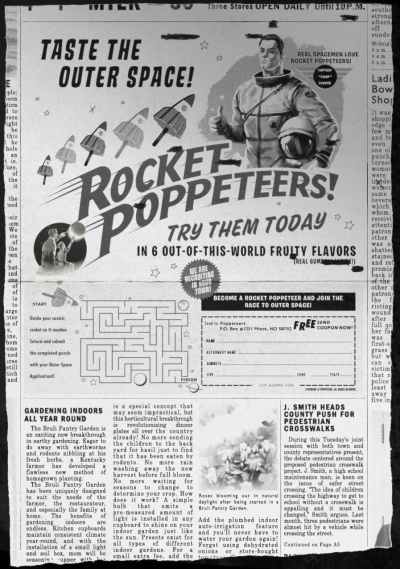 The half-page ad is for Rocket Poppeteers, with Gordon Cooper appearing as the mascot. Good evening, my fellow citizens: I speak to you tonight in a spirit of hope. The treaty initialed yesterday, therefore, is a limited treaty which permits continued underground testing and prohibits only those tests that we ourselves can police. It requires no control posts, no on-site inspection, no international body. This treaty is in part the product of Western patience and vigilance. We have made clear-most recently in Berlin and Cuba our deep resolve to protect our security and our freedom against any form of aggression. We have also made clear our steadfast determination to limit the arms race. In three administrations, our soldiers and diplomats have worked together to this end, always supported by Great Britain. Prime Minister Macmillan joined with President Eisenhower in proposing a limited test ban in 1959, and again with me in 1961 and 1962. But the achievement of this goal is not a victory for one side-it is a victory for mankind. It reflects no concessions either to or by the Soviet Union. It reflects simply our common recognition of the dangers in further testing. This treaty is not the millennium. It will not resolve all conflicts, or cause the Communists to forego their ambitions, or eliminate the dangers of war. It will not reduce our need for arms or allies or programs of assistance to others. But it is an important first step-a step towards peace-a step towards reason- a step away from war. Here is what this step can mean to you and to your children and your neighbors: First, this treaty can be a step towards reduced world tension and broader areas of agreement. The Moscow talks have reached no agreement on any other subject, nor is this treaty conditioned on any other matter. Under-Secretary Harriman made it clear that any non-aggression arrangements across the division in Europe would require full consultation with our allies and full attention to their interests. He also made clear our strong preference for a more comprehensive treaty banning all tests everywhere, and our ultimate hope for general and complete disarmament. The Soviet Government however, is still unwilling to accept the inspection such goals require. But the difficulty of predicting the next step is no reason to be reluctant about this step. Nuclear test ban negotiations have long been a symbol of East-West disagreement. If this treaty can also be a symbol-if it can symbolize the end of one era and the beginning of another-if both sides can by this treaty gain confidence and experience in peaceful collaboration- then this short and simple treaty may well become an historic mark in man's age-old pursuit of peace. Western policies have long been designed to persuade the Soviet Union to renounce aggression, direct or indirect, so that their people and all people may live and let live in peace. The unlimited testing of new weapons of war cannot lead towards that end-but this treaty, if it can be followed by further progress, can clearly move in that direction. But those dangers pale in comparison to those of the spiraling arms race and a collision course toward war. Since the beginning of history, war has been mankind's constant companion. It has been the rule, not the exception. Even a nation so young and as peace-loving as our own has fought through eight wars. And three times in the last two years and a half I have been required to report to you as President that this nation and the Soviet Union stood on the verge of direct military confrontation-in Laos, in Berlin and in Cuba. A war today or tomorrow, if it led to nuclear war, would not be like any war in history. A full-scale nuclear exchange, lasting less than 60 minutes, with the weapons now in existence, could wipe out more than 300 million Americans, Europeans and Russians, as well as untold millions elsewhere. And the survivors, as Chairman Khrushchev warned the Communist Chinese, "the survivors would envy the dead," For they would inherit a world so devastated by explosion and poison and fire that today we cannot even conceive of its horrors. So let us try to turn the world away from war. Let us make the most of this opportunity, and every opportunity, to reduce tension, to slow down the perilous nuclear arms race, and to check the world's slide toward final annihilation. Second, this treaty can be a step towards freeing the world from the fears and dangers of radioactive fallout. Our own atmospheric tests last year were conducted under conditions which restricted such fallout to an absolute minimum. But over the years the number and the yield of weapons tested have rapidly increased and so have the radioactive hazards from such testing. Continued unrestricted testing by the nuclear powers, joined in time by other nations which may be less adept in limiting pollution, will increasingly contaminate the air that all of us must breathe Even then, the number of children and grandchildren with cancer in their bones, with leukemia in their blood, or with poison in their lungs might seem statistically small to some, in comparison with natural health hazards. But this is not a natural health hazard-and it is not a statistical issue. The loss of even one human life, or the malformation of even one baby-who may be born long after all of us have gone-should be of concern to us all. Our children and grandchildren are not merely statistics towards which we can be indifferent. Third, this treaty can be a step towards preventing the spread of nuclear weapons to nations not now possessing them. During the next several years, in addition to the four current nuclear powers, a small but significant number of nations will have the intellectual, physical, and financial resources to produce both nuclear weapons and the means of delivering them. In time it is estimated, many other nations will have either this capacity or other ways of obtaining nuclear warheads, even as missiles can be commercially purchased today. I ask you to stop and think for a moment what it would mean to have nuclear weapons in so many hands, in the hands of countries large and small, stable and unstable, responsible and irresponsible, scattered throughout the world. There would be no rest for anyone then, no stability, no real security, and no chance of effective disarmament. There would be only be the increased chance of accidental war, and an increased necessity for the great powers to involve themselves in what otherwise would be local conflicts. It is also true, as Mr. Khrushchev would agree, that nations cannot afford in these matters to rely simply on the good faith of their adversaries. We have not, therefore, overlooked the risk of secret violations. There is at present a possibility that deep in outer space, that hundreds and thousands and millions of miles away from the earth illegal tests might go undetected. But we already have the capability to construct a system of observation that would make such tests almost impossible to conceal, and we can decide at any time whether such a system is needed in the light of the limited risk to us and the limited reward to others of violations attempted at that range. For any tests which might be conducted so far out in space, which cannot be conducted more easily and efficiently and legally underground, would necessarily be of such a magnitude that they would be extremely difficult to conceal. We can also employ new devices to check on the testing of smaller weapons in the lower atmosphere. Any violation, moreover, involves, along with the risk of detection, the end of the treaty and the worldwide consequences for the violator. Secret violations are possible and secret preparations for a sudden withdrawal are possible, and, thus, our own vigilance and strength must be maintained, as we remain ready to withdraw and to resume all forms of testing, if we must. But it would be a mistake to assume that this treaty will be quickly broken. 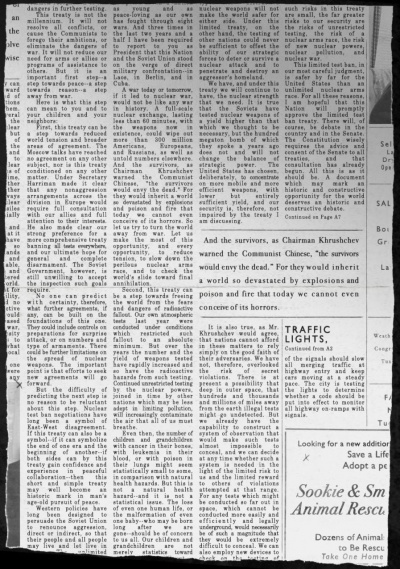 The gains of illegal testing are obviously slight compared to their costs, and the hazard of discovery, and the nations which have initialed and will sign this treaty prefer it, in my judgment, to unrestricted testing as a matter of their own self-interest, for these nations, too, and all nations, have a stake in limiting the arms race, in holding the spread of nuclear weapons, and in breathing air that is not radioactive. While it may be theoretically possible to demonstrate the risks inherent in any treaty, and such risks in this treaty are small, the far greater risks to our security are the risks of unrestricted testing, the risk of a nuclear arms race, the risks of new nuclear powers, nuclear pollution, and nuclear war. This limited test ban, in our most careful judgment, is safer by far for the United States than an unlimited nuclear arms race. For all these reasons, I am hopeful that this Nation will promptly approve the limited test ban treaty. There will, of course, be debate in the country and in the Senate. The Constitution wisely requires the advice and consent of the Senate to all treaties, and that consultation has already begun. All this is as it should be. A document which may mark an historic and constructive opportunity for the world deserves an historic and constructive debate. It is my hope that all of you will take part in that debate, for this treaty is for all of us. It is particularly for our children and our grandchildren, and they have no lobby here in Washington. This debate will involve military, scientific, and political experts, but it must be not left to them alone. The right and the responsibility are yours. If we are to open new doorways to peace, if we are to seize this rare opportunity for progress, if we are to be as bold and farsighted in our control of weapons as we have been in their invention, then let us now show all the world on this side of the wall and the other that a strong America also stands for peace. There is no cause for complacency. We have learned in times past that the spirit of one moment or place can be gone in the next. We have been disappointed more than once, and we have no illusions now that there are shortcuts on the road to peace. At many points around the globe the Communists are continuing their efforts to exploit weakness and poverty. Their concentration of nuclear and conventional arms must still be deterred. 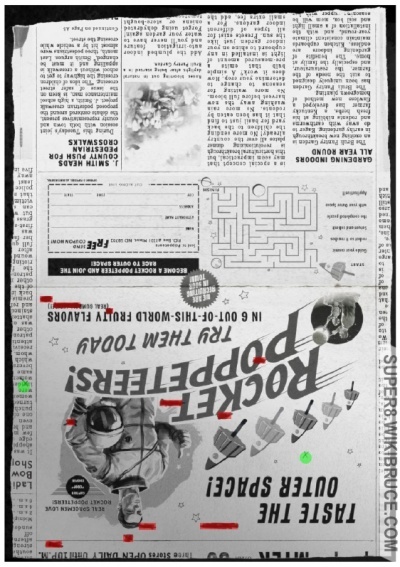 Two "X"s can be seen on each page, and page 1 has regions of black marked over the Rocket Poppeteers ad. 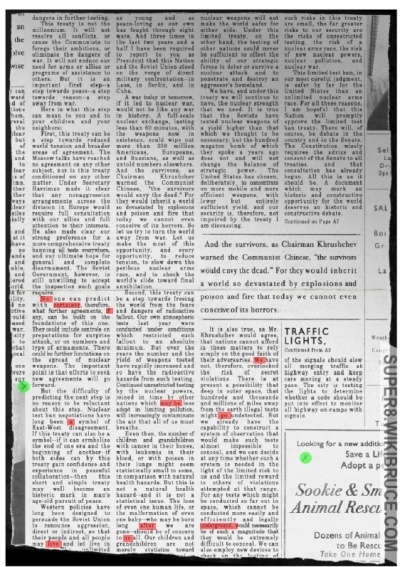 Rotating page 1 and aligning the X's positions, the highlighted regions appear over words on page 2. The phrase may be interpreted various ways but imply the same theme - "There is no certainty if [target] is alive. [Target] may be after us. We must go underground to hide from [target]."